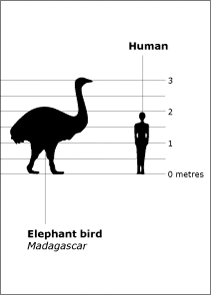 There once existed a bird of massive size, aptly named the Elephant bird. Over the course of history humanity rode several kinds of animals to war: horses being by a wide margin the most common. However, no large birds were ridden by ancient people. The still-living example of elephants birds, the ostrich, can run at speeds of up to 70 kph. A horse can travel only 48 kph. Thus, it is safe to assume that an elephant bird would also be faster. What's more, an ostrich's kick has been known to be able to kill a lion - and the ostrich is the smaller, weaker version of the Elephant Bird. Modern people have proved that ostrich riding is possible. So I was wondering, could Elephant Birds be domesticated and/or trained? If so, would they be feasible as warmounts? I think yes...but a few considerations. I'd almost refer to an old answer about using buffalo as heavy cavalry, I'll link that after the post. First to consider is the relationship with man that birds have compared to horses. Somewhere along the way in the domesticated horse, a relationship with humans became core to it...they seek us and our companionship. This makes riding them (even untrained) a much easier prospect. Ostriches...I've dealt with domesticated birds before and even then they are flighty creatures at best. But lets say whatever people this is has domesticated the ostrich to the point of the horse just to overcome that. I also have this feeling that they aren't exactly bright animals and are just as likely to start feeding on the ground as they are to take a command from something riding it. Ostriches are ultimately birds and have a different skeletal make-up that we do. Even a full grown Ostrich is lucky to hit 120 kilo's...compared to a horse, this is exceedingly light. This does limit the effectiveness of the ostrich mounted unit...part of why a cavalry charge is so effective is you are throwing the weight of a 300kg + horse at the weight of a human...this isn't quite so in the ostrich case. So as far as using these as head on charging troops, I think you are pretty limited. Ostriches are also quite a bit more fragile than a horse...the long neck is a target just waiting to be hit by whatever these troops are fighting. Birds bones are a little more fragile as well, so I doubt this ostrich could really take a hit if and when it happened. But that isn't the question...question was regarding light cavalry. Light cav are primarily used for chasing down routing opponents and hitting ranged troops (such as archers) as quickly as possible. From that standpoint, it seems these could work. However, I suspect the best use of these would be to combine the Mongols golden horde technique with the Ostrich...bird mounted archers. They never fully engage troops (gets around the fragile and flighty/spooked portion) and use their mobility to avoid direct combat. Assuming they are as fast as the questions states and can take orders from a rider (remember the rider needs both hands for the bow), they could actually be quite effective. Even more-so if the opponents light cavalry couldn't chase them down. Is it plausible as a mount? Yes. It's already been pointed out that ostriches are viable mounts, and there are even ostrich races. However, it's irresponsible to assume or assert that the elephant bird would be faster than a horse. I have seen no indication we know how fast they were, so I can only point out what is comparatively true. The more mass, the more energy it takes to move. This would mean that, like the elephant, it could be faster than humans, but won't win a race with a horse. It takes more 'horse power' to make a larger beast move, and more energy to sustain it. Not to mention we know little about these creatures. Would they take to (semi-)domestication? Would they be worth the effort to encourage us to continue trying? Would they need more care and sustenance than horses and/or elephants and/or ostriches? In other words, is it worth the investment? Would their top sprinting speed be worth it? Would they be trainable enough to selectively breed them for endurance, a would be needed in a war mount? Arguably, any creature large enough to support the weight of a ride (in armour) is a viable war-time mount. All it takes is time to selectively breed them for the most describable traits, and training them to be able to handle the strain and stress of it battle. So the question, really, is what animal is worth the investment to you?